PT Bank Rakyat Indonesia (Persero) Tbk - Bank BRI (IDX : BBRI) more popularly called "BRI" is a state-owned commercial banking company in Indonesia with core business focus on micro, small, and medium enterprises (MSME’s) segment. 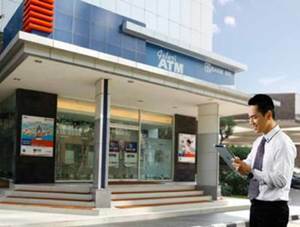 Based in Jakarta, BRI is a commercial bank which is majority owned by the Government of Indonesia. At present, BRI is 56.75% owned by the Government of Indonesia and 43.25% by general public and investors. As of December 2015, BRIconducted business operations in all parts of Indonesia under the management of 19 regional offices, 467 branch offices, 603 sub branch offices, 5,360 BRI Units, 983 cash offices, 2,543 Teras BRI units, and 636 Teras Mobile Units. The State-Owned Bank also supported by 4 directly-owned subsidiaries and 1 associated company; PT Bank BRISyariah (BRISyariah), PT Bank Agroniaga Tbk (BRI AGRO), BRingin Remittance Co Ltd, PT Asuransi Jiwa Bringin Jiwa Sejahtera and PT BTMU-BRI Finance. In term of financial performance, PT Bank Rakyat Indonesia (Persero) Tbk succeeded in posting excellent financial performance in 2016. The financial performance of BRI recorded its total assets at Rp 1,003.64 trillion, and the comprehensive income for the year 2016 at Rp 41.38 trillion. These income figures showed an increase of 14.25% and 66.37%, according to PT Bank Rakyat Indonesia (Persero) Tbk Full Year 2016 Financial Statement (Full Report - Audited) as cited by JobsCDC.com. Total assets BRI in 2015 amounted to Rp 878.24 trillion and total comprehensive income for the year 2015 was recorded at Rp 24,87 trillion. Minimum Associate Degree (D3) from an accredited major ; Aconomics/Accounting, Engineering, MIPA and Computer (IT). Male : minimum height of 165 cm. Single/not married, completed with a letter from the local village office. Willing to be placed in all working area of BRI (Signed stamped statement). Copies of ID Card, NPWP, SKCK, BRI saving account. JobsCDC.com now available on android device. Download now on Google Play here. Please be aware of recruitment fraud. The entire stage of this selection process is free of charge. 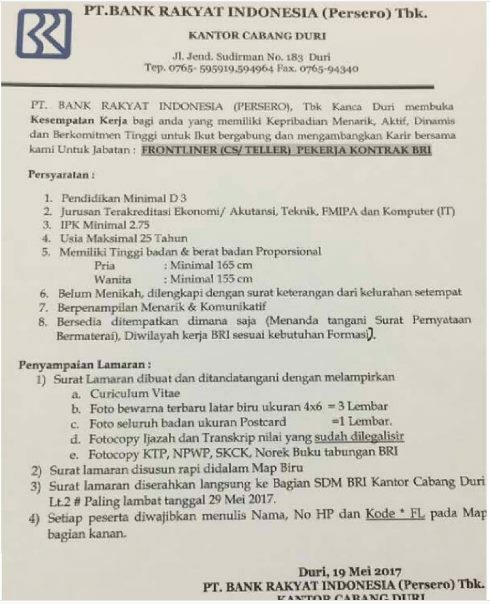 PT Bank Rakyat Indonesia (Persero) Tbk - D3 Frontliner CS Teller BRI May 2017 will never ask for fees or upfront payments for any purposes during the recruitment process such as transportation and accommodation.